Low testosterone is a condition common in older men, but younger men are not immune. 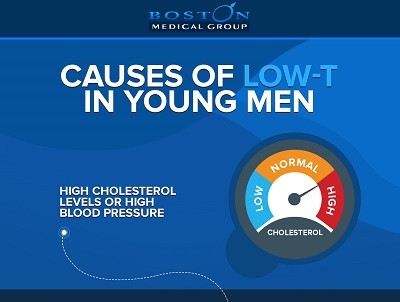 The graphic below depicts some of the possible causes of Low-T in young men. There are a number of symptoms associated with Low-T, and you can review them here: Low-T Symptoms Every Man Should Know. If you feel you may have low testosterone then Boston Medical Group has ways to determine if you do and how severe it may be. What are the causes of PE?